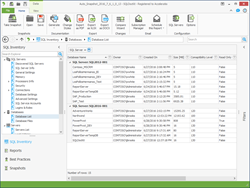 Acceleratio Ltd. has released a new tool to help with SQL Server management. SQLDocKit is a Windows-based application that autodiscovers SQL Server instances in your domain, creates reports gathering information about your servers and database properties, generate an inventory documentation of the entire SQL Server environment. Our idea was to create a simple documentation tool for SharePoint admins. That tool was SPDocKit. Stemming from this positive response, we thought about how we could offer the same benefits to SQL admins. Meet the new kit on the block. Acceleratio Ltd. brings you SQLDocKit, a new SQL Server administration tool. In a matter of minutes, you can autodetect all SQL Server instances in your organization and generate elaborate documentation listing all the servers, server settings, and databases in your domain. Acceleratio Ltd. has released a new tool to help with SQL Server management. SQLDocKit is a Windows-based application that autodiscovers SQL Server instances in your domain, creates reports gathering information about your servers and database properties, generate an inventory documentation of the entire SQL Server environment. With usage reports covering storage metrics, orphaned databases, unused databases and more, SQLDocKit offers valuable, easily accessible information about your servers and databases. Following in the footsteps of SPDocKit, which has become increasingly popular among SharePoint administrators, SQLDocKit is designed to give SQL administrators a trustworthy tool for managing any SQL Server environment. Our main goal for this tool is to provide a solution for a problem sysadmins face very day: Discovering and listing every SQL Server instance and database across an entire organization when you don’t even know where they are. SQLDocKit comes with a variety of features to help developers and testing departments within organizations. Scanning an entire domain to search for installed SQL Server instances is as a piece of cake for SQLDocKit. In addition, SQLDocKit can audit SQL Server configuration and compare different SQL Servers. The compare feature can then be used to detect differences made over time and avoid any potential problems in the environment. The ability to document and inventory the contents of your SQL Server domain is very beneficial when creating SQL server inventory documentation in one document. Even better, all reports and generated documentation can be exported in DOCX and PDF file formats. In addition to being a time-saver and offering high productivity for growing organizations, SQLDocKit is that it automates boring, routine administrative tasks. SQLDocKit is priced per SQL server or consultant. The tool is now available for download at http://www.sqldockit.com, and we’re offering a 30-day free trial. Acceleratio Ltd. is a software development company founded in 2009 and based in Zagreb, Croatia. The company, which is known for developing popular tools such as SPDocKit, SysKit, and CloudKit 365, creates high-quality enterprise software solutions for SharePoint, Office 365, Windows Servers, Remote Desktop Services, and Citrix admins and consultants around the world.